My 2008 Suzuki swift drivers door won`t lock with the fob. Hi my 2008 Suzuki swift drivers door won`t lock with the fob. so the passengers door will open when I start the vehicle engine... after entering with the key? help please.Adrian. JA: Have you checked the fob's battery? Customer: Yes . just pust a brand new Panasonic one in. JA: Are you fixing your Swift yourself? What have you tried so far? Expert: CarDoc replied 10 days ago. Thank you for using JA. I am Shahbaz, one of the experts. Do any of the other doors lock with the fob? Hi Shahbaz, yes all the other doors lock with the fob, but only open when I start the engine from in the car. Strange. So if you stand outside the car and press unlock button as you normally would, it won't open any of the doors? That's right.... but the lock button does lock every door but the drivers door? Can you use the key manually to open the drivers door? It seems like the driver door lock actuator is not working. I would suggest that you connect a fault code reader and see if there are any fault codes stored on the vehicle. I've been using the key to get in the vehicle all weekend . Haven't got a fault code reader, is that a dealer thing. Every garage should have a fault code reader in this day and age, the dealers will obviously charge a lot more than a smaller garage. 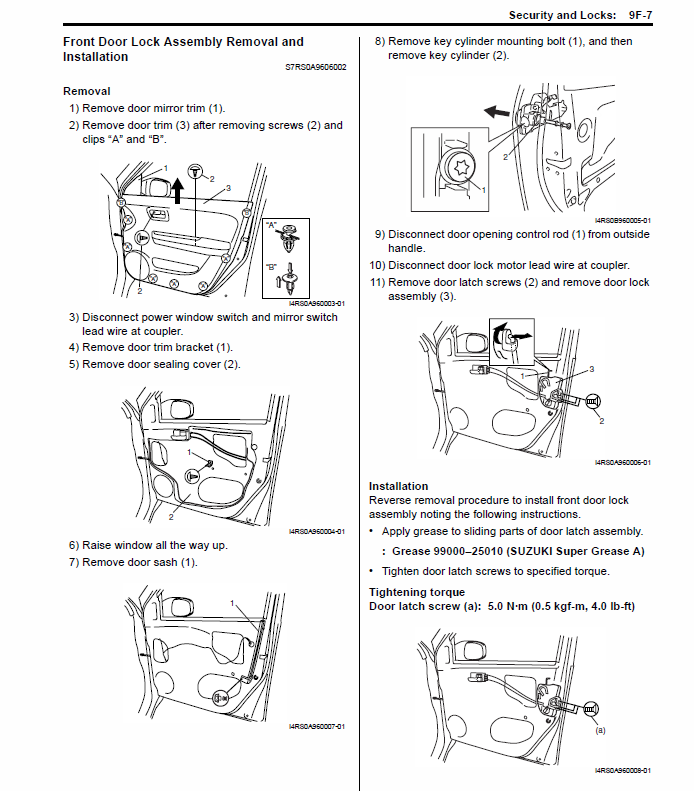 If you find that the door lock actuator is faulty (which I think it is), I have attached an image which shows you how to remove it (if you want to do it yourself). Sounds good buddy. Thanks for your advise. Glad I could help. Thank you for using JA.